Two axle widths are available to best fit a variety of cropping row widths. The narrow width axle has a tread width from 183 cm to 224 cm (72 in. to 88 in.) and a clearance of 112 cm (44 in.). The wide axle has a tread width from 234 cm to 307 cm (92 in. to 121 in.) and a clearance of 127 cm (50 in.). Axle range for wide machines varies slightly depending on the option (hydraulic vs. manual tread adjust) that is being used. NOTE: In order to achieve 229-cm (90-in.) tread spacing, IF320/80R42 tires must be used with AN401678 rims. Please see your local John Deere Dealer for more information. With these tread spacings, the R4023 Sprayer holds an impressive 46-54 weight split when unfolded, fully loaded. This weight split helps to reduce compaction through the field and keeps the power to the ground. The wide axle is ideal for the Midwest grain farmer. With the wide axle option, the operator can straddle three rows at 76.2-cm (30-in. ), 81.3-cm (32-in. ), 86.4-cm (34-in. ), 91.4-cm (36-in. ), 96.5-cm (38-in. ), or 101.6-cm (40-in.) spacing or four rows at 76.2-cm (30-in.) spacing. The narrow axle is ideal for the cotton or specialty crop farmer. With the narrow axle option, the operator can straddle two rows at 91.4-cm (36-in. ), 96.5-cm (38-in. ), or 101.6-cm (40-in.) row spacing. 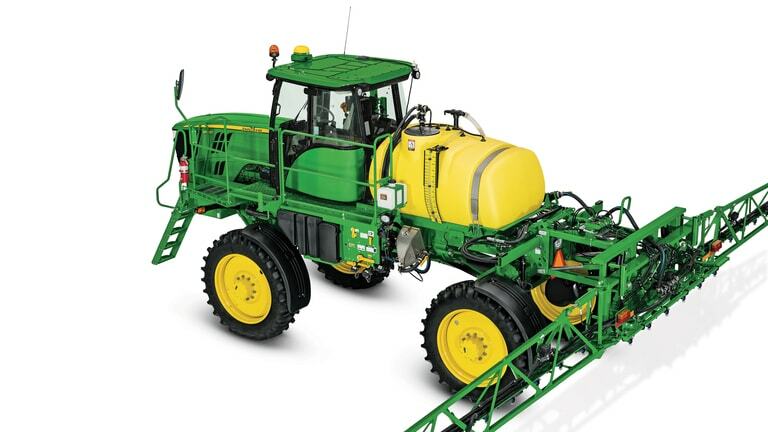 The suspension design on the R4023 Sprayer uses a four-bar link system along with an air bag and shock combination to provide a comfortable ride. 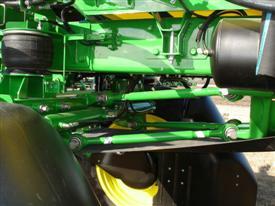 Two large air springs sit atop each axle, similar to those used on over-the-road trucks and other John Deere sprayers. These air springs are dampened with oil-filled shocks to smooth the ride. Connecting rods link the axle to the large cast mount that is bolted to the C-channel frame with a Huck® bolt. The axle-connecting rods are parallel for vertical motion and cross linked for lateral stability. The R4023 Sprayer's standard suspension provides for 152 mm (6 in.) of travel at the air bag. The air springs are underneath the frame; therefore, visibility of the rows passing underneath is free of suspension components. The air springs are adjusted by adding or removing air through a standard air-stem valve on top of each spring or, if the sprayer is equipped with auto air-spring leveling, the air springs will inflate to the optimum level for the best-possible ride. The auto air-spring leveling system is standard equipment. This feature maintains ride height, ensuring 102 mm (4 in.) of travel up and down at all times for 203 mm (8 in.) of total travel. The operator does not have to individually fill each bag or deflate each bag for transport, saving as much as 10 minutes. A switch located near the solution loading system deflates all four bags at one time. 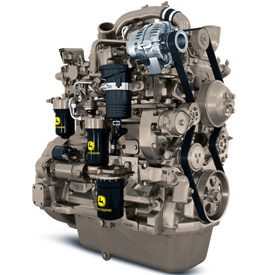 Once the machine is running, the on-board air compressor automatically inflates the bags to the optimal set ride height. Huck is a trademark of Alcoa Incorporated. The R4023 Sprayer's great ride begins with the frame. 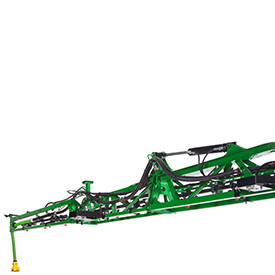 The frame construction allows the R4023 Sprayer to absorb rough field conditions that the operator may encounter. The frame consist of two strong parallel C-channels that are connected by suspension castings and reinforcement cross members. The cross members are connected to the frame using Huck bolts. Huck bolts combine the advantages of a high-strength bolt and rivet. These fasteners provide greater vibration resistance and a joint that will never loosen compared to standard bolts. 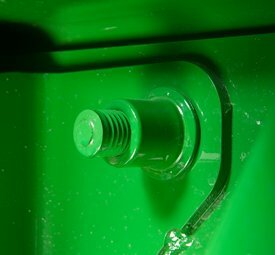 This style of frame and fastener is commonly used on over-the-road trucks and trailers. 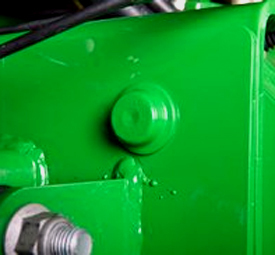 The R4023 now offers two factory installed shock solutions to accommodate various field conditions. For optimal comfort in rough or uneven terrain conditions such as no-till or stripped fields, a Soft Shock option is now available. 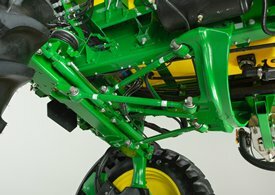 The Soft Shock will take the place of the adjustable shock dampener used on the 4630 and will be offered as a factory-installed option. This fixed shock provides 50 percent less dampening force which allows for a smooth ride up to 32.2 km/h (20-mph) spray speed in those uneven field conditions. The Soft Shock may also provide a more responsive feel for operators in turns or when starting/stopping quickly. NOTE: The standard shock option is unchanged from previous models and is recommended for general use. When operators first enter the model year 2018 R4023 cab, they will notice that there have been significant changes made. Key sprayer controls are more easily accessible to the operator on the redesigned CommandARM and the multifunction handle has a more ergonomic fit and feel. The multifunction handle has six reconfigurable buttons, a scroll to select speed range, and allows operators to better manage their headlands with the Headland Management System (HMS™) button. 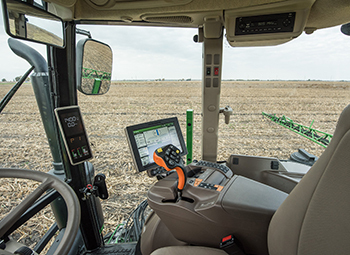 To finish out the upgrades, the GreenStar™ display has been upgraded to a faster, more user-friendly 4600 CommandCenter™ display, which allows operators to efficiently capture, manage, and transfer data. Having the optimal weight distribution results in a lighter footprint leaving less compaction and less damage to the field, allowing the operator to get into the field earlier. 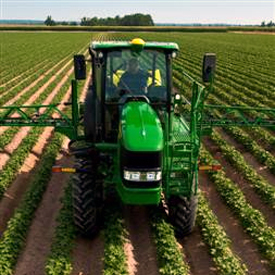 The R4023 Sprayer was built with the optimal weight distribution. The R4023 Sprayer provides 129 kW (173 hp) with a 5 percent power bulge to 136 kW (182 hp) and 6071 kg/cu m (538 lb-ft) of peak torque to get through tough field conditions. In addition to reducing emissions and lowering engine idle noise, its compact size allows it to fit neatly under the hood for great visibility of the rows passing underneath the operator. 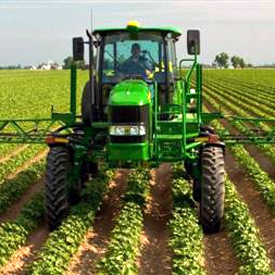 An increase in fuel tank size makes it possible to spray for up to 16 hours without refueling. 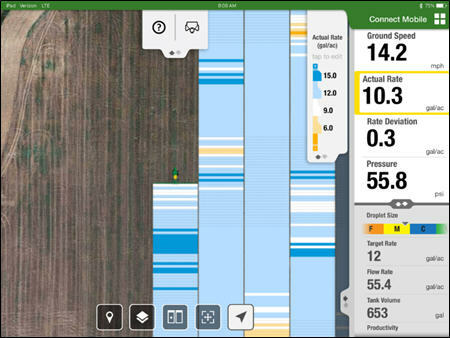 By equipping the R4023 Sprayer with a 310-L (82-gal.) fuel tank, the operator will have plenty of fuel to spray for a full day. NOTE: Not all products or models are available in all regions. Refer to your local John Deere Dealer for product availability. NOTE: JDLink Connect features are model dependent. 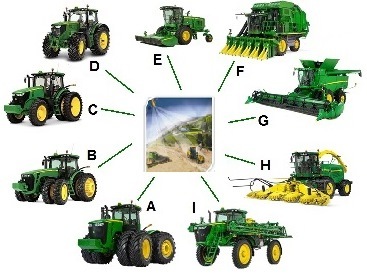 Confirm with a John Deere dealer what specific features are available. 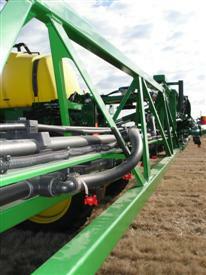 The R4023 Sprayer's booms are built with high-strength square tube. The boom incorporates a strong 3-D design. This design gives the boom more strength to resist fore-aft loading generated by starts, stops, and turns, as well as twisting loads caused by folding and unfolding operations. The boom plumbing and nozzles are set between and up inside the two bottom square tubes of the boom structure. This protects the nozzle bodies from hitting objects that could damage the sprayer or affect the spray pattern. The R4023 boom comes in an 18.3-m/24.4-m (60-ft/80-ft) or 18.29-m/27.44-m (60-ft/90-ft) configuration. Simply fold in the outer wing and go from spraying at 24.4 m/27.44 m to 18.3 m (80 ft/90 ft to 60 ft). When the outer wing is folded over top, it is supported by cradles to ensure it will remain in place and secure while spraying in the 18.3-m (60-ft) configuration in rough fields. The breakaway ends of the boom offer the operator protection against damaging the boom if the boom unexpectedly hits an obstacle. The breakaway section of the boom uses a design that holds the breakaway from breaking backward while operating normally in the field, but when something is contacted, it will move rearward and out of the way to prevent major damage. Each breakaway section resets using a spring, and then resets back to the spray position. When the booms are folded in, the transport cradles on the machine support a large portion of the boom that, in turn, spreads out the stress. While in transport position, the booms are cradled so that visibility is maximized to either side of the sprayer. By folding the booms flat, visibility is increased and the overall height of the machine is not affected.